Sometimes it isn’t that you can’t go home again, but that going home again is hard. That’s more of the case for Juliet Capshaw. For years, she has been away from her Oregon hometown and the bakery that her parents own and have operated for as long as Jules can remember. But her time on board a luxury cruise ship as a pastry chef has come to an abrupt end; just like her marriage. Returning to dry land is meant to be a pit stop for Jules; a chance to sort through her tangled fears and feelings and to figure out what to do next. 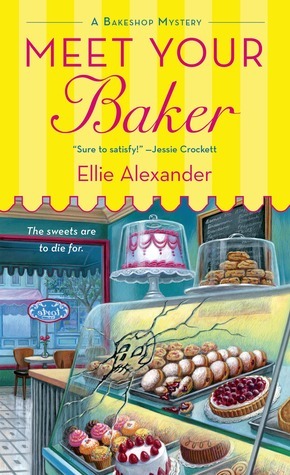 But finding a dead body in the kitchen at Torte (her family’s bakery) puts a wrench in all of Jules’s plans. The complexities of her crumbling marriage are quickly thrust aside as Jules gets tangled in the mystery of who in her seemingly idyllic small town could be a killer. The details of Ashland, Oregon are painted to create a charming canvas, which author Ellie Alexander fills with an eclectic cast. The story is infused with dashes of Shakespeare and sprinkled with mouth-watering descriptions of the tasty treats Jules and her mom create in the kitchen at Torte. (Thankfully, recipes are included!) The story is complete while leaving plenty of plot threads untied for subsequent stories in the Bakeshop Mystery series. All in all, Meet Your Baker is a tantalizing beginning to a new cozy series! Pingback: A Crime of Passion Fruit by Ellie Alexander – Live and breathe books.